This last Sunday, McDonald’s –the official restaurant o the 2014 FIFA World Cup- sponsored the World Cup Viewing Party on the Big Screen at the ICON Theater in Chicago. 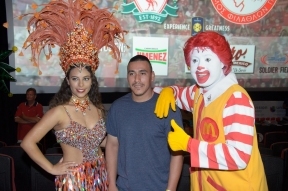 The McDonald’s Owner/Operators of Chicagoland and Northwest Indiana gave 24 lucky winners the opportunity of a lifetime: to see the final game of the World Cup with their family and friends in a theater and to enjoy it as if they were in Brasil. They had the opportunity to enjoy fun pre-game activities that included the appearances of Ericka Pino, meteorologist of Univision and Ronald McDonald as well as Brazilian dancers. They all received World Cup branded prizes and they took home a souvenir photo to remember a memorable afternoon.